This is The Studio Downunder, in the basement of our house. I do all my art there. Art has been my passion throughout my life. The first time a teacher praised me for my work was in the third grade. I created a russet colored horse against a burnt orange cliff. I was hooked from then on!!! I've lived in 7 countries with my husband, Bill, and I've studied Art in all of them. I love to paint animals, birds, and plants, with bright, joyful colors. Recently I was going through some older written exercises inspired by Julia Cameron's Artist Way, and I saw that I believed one of my creative blocks from my college days was a comment one of my painting professors made saying that I had the artistic sensibilities of a 12 year old. I carried this with me as a negative comment until this week when I realized the guy must have been psychic!!! Now I'm illustrating and writing books for 12 year olds, and I'm loving it. Amazing, right? My children’s books are filled with animals with Olivia Ocelot as the main character. Olivia has sloths, howler monkeys, jaguars, iguanas. owls, and hundreds of other birds in her neighborhood. Her neighborhood is a lush, tropical rainforest in Costa Rica with orchids, palmettos and palm trees all over. I want Olivia Ocelot to become a household name with children's books, wall art, clothing and dishes all decorated with her face. I think Ocelots are about the coolest cats on the planet. I'm working on the sequel now which is set in the desert in Arizona. I have a head start on this book because we lived in Arizona for 3 years. I've been an artist all my life. 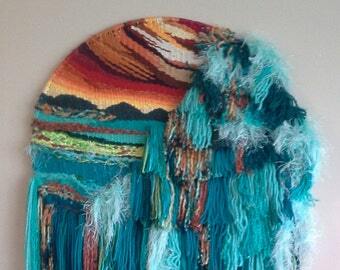 I've always loved painting, and Tapestry weaving - painting with yarn and fiber. Lately, I discovered children's book creation. Bill and I were fortunate to live in 7 countries and 7 states with Computer Design jobs. Bill was born in Detroit. He spent 4 years in the Air Force at Plattsburgh Air Force Base, Anne's hometown. Afterwards Bill got into car design. Together he & Anne traveled the world while he worked for famous companies like Volvo, Porshe, BMW.